gardens of the Gateway Village Tourist Park and then getting ready to go. We decided to give the van a little bit of a hose down but were surprised to be interrupted by a man from the van next door telling us that using hoses was not allowed because of the severe water restrictions. We hadn’t known so were grateful for the heads up. He probably thought we were pushing our luck but it was pure ignorance. Again today there was about 100kms to cover to the next town with very little to see along the way. As our caravan park was at the beginning of the Summerland Highway we saw no point in going back through Grafton to get to the Pacific Highway – they both headed parallel to one another anyway and by doing the Summerland route we would get to see Casino, which we wouldn’t bother diverting to if we went via the Pacific Highway. I wish we hadn’t frankly. This was the only stage of our holiday where we were bored. There was nothing but a few creeks; well alright many, many creeks, to break up the monotony of this road. 100 kms of really unchanging scenery. If it wasn’t for contemplating how on earth they managed to come up with enough names for all these creeks we’d have been forced to play eye spy, and it came close even then! I’m glad we saw Casino, but we didn’t stop. It’s a town by the way, for anyone who thinks we went on a gambling spree. It had nothing particularly appealing or interesting about it and some of the houses were so very old with rusting iron rooves and weatherboard exteriors, but there were new houses too. Quite a strange mixture really. We turned right here to head back towards the coast, and Lismore that was halfway there. Lismore was a big place and I saw lots of farming equipment and supply stores that I get asked for at work. We found the tourist information place here because I’d been told of a rainforest walk that we fancied. This seemed odd to me because the area was not wooded at all and I wondered how much of a drive would be involved, so we asked the girl about this and she said that they had a simulation right there in the tourist information building and that was probably the one I had heard about. It cost $1 each, was about 5 metres long, and had 2 televisions with birds and bird sounds playing, a little waterfall that wasn’t turned on, dimmed lighting and frazzled ropes and dusty imitation leaves all around the place. We had a bit of a giggle, but what do you want for $1. We waited a polite length of time before coming out and asked if she could recommend somewhere nice for coffee, and she certainly did that. Along the road a little, right near the bus depot which David enjoyed watching, was a café named the Left Bank. We had a delicious meal here. I had spinach, ricotta and pumpkin cannelloni and David took forever to make up his mind and I can’t remember what he did order in the end. The poor waitress came back 3 times before he’d decided – most unlike him. And we watched long distance coaches arrive, load up and leave and the ‘local’ buses as well. Even these were coaches rather than buses, but we’re speaking a long way away from major cities so that’s understandable. There were some major works going on behind the café where they were improving the flood breaks, so I would guess there are usually river views from there, but it was a lovely meal and that’s the main thing. the photos for Lismore and Ballina but I think it was Lismore. Anyway, I loved the way it has an adult height and a children’s height part and thought it was picture-worthy. the highway as we drove through the middle of it. 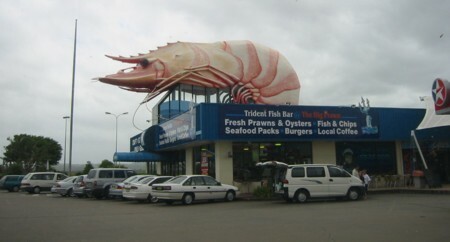 One thing did get our attention though and we stopped just long enough to take a photo – the biggest ‘prawn’ you’ve ever seen in your life on top of a building. It would have been about 5 metres long I’d say and was there to attract attention for the teensy shopping centre under its feet. Well it certainly did that! ocean from time to time for a change, as the main highway was too far inland to do that, and the road climbed and dipped. 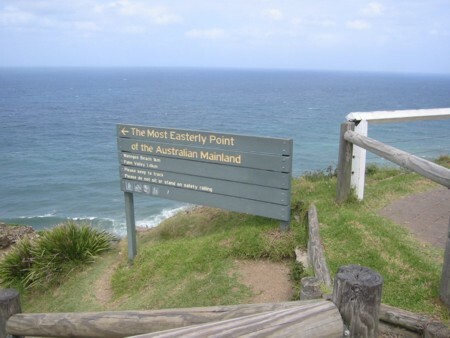 Soon there was a layby that we decided to stop at and we were looking over Lennox Head from almost the top of a steep hill. The surfers were loving the waves down on the ocean and we were loving the view from up here. We decided to climb the rest of the hill to look from the top and David told me off for standing too close to the edge of the cliff. I wasn’t right on the edge and I felt perfectly safe, and surely if I (of all people) felt safe it must have been OK. But I was grateful he cared. It was a grassy hill, not a rocky one, and I think that helped me to trust it; though I have to admit the wind was blowing strongly from behind me. On that thought I stepped back a bit. It was lovely there, but it was just a leg stretch and we got on our way again. 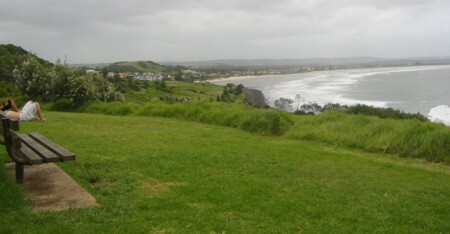 The houses of Lennox Head which we then passed by looked as if they’d be worth a bit. that. It was a particularly steep road with only one-way traffic on part of it and we parked the van half way up the hill when we reached a point that told us going any further would incur a charge. Misers aren’t we? Anyway, we got out of the van and the first thing we saw was a glider circling above us, accompanied by 2 hang-gliders, and David quickly noticed that the hang-gliders were both tandem. It was a tourist attraction where you shackle up with a professional and jump off the cliff together. Not for me thank you, but it was good to watch these guys and they certainly were skilled with the air currents, climbing steeply within feet of jumping and staying at a steady height. I loved the noise that the glider made as it swooped past too. north, not east, and would have been a heck of a climb back up so we didn’t. Short of time was an excellent excuse here we felt. 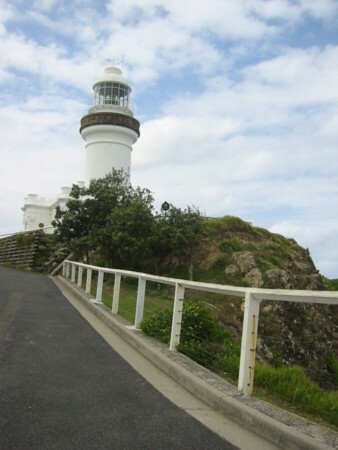 So we hauled back up all the steps to the lighthouse – easy peasy with our training of the past 1½ weeks. There was a little shop here, of course, and we called in to buy some water, and got a postcard as well, before descending the hill back to the van and going to look at more of Byron as we drove through it. We did not stop, they required parking tickets and I thought that was a darned cheek. Do they want me to shop in their shops or not? So for Byron… I can’t see what the stars see in it, though there sure were some pricey looking houses there. Basically it was a ‘sea-side holiday village’ like any number of others except for the paid parking LOL. 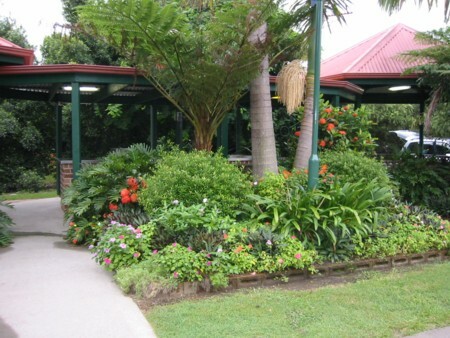 Our next destination was Mullumbimby. This involved a tiny detour off the highway, which we had rejoined a little way after Byron. There are 2 places within 30 kms of one another, Mullumbimby and Murwillumbah, both of which have names that I find fascinating. We decided to see just the smaller of the 2 because if we saw both I’d never keep them separate in my head. We turned off the highway and then left down a road where there were quite a few ladies with cars which David said were probably waiting for the school bus – I bet he’s right. Not very far down this road was Mullumbimby, a small and obviously very old place, really pretty and exactly what you would expect and want of a country town, complete with the obligatory river. On the way down the road into Mullumbimby I had commented on one of the mountains to the right of it and how very pointed it was at the top, a real witch’s hat shape. Now we circled the township and decided that as it had been such a short distance we may as well go back the way we’d come, and at about this time one of us must have lost our male/female translation chips. David drove across a bridge in completely the opposite direction of where we’d come from so I thought “OK we’re going a different way” and looked at the map to make sure we were going in the right direction. The road immediately got extremely narrow and winding and started to climb. Oh no, I don’t think I could take any more mountains!!! But suddenly I noticed the pointy mountain and said to David “Oh, it’s OK we must be going in the right direction because this was on the right as we came in and now it’s on our left. So what does he do? Chucked a ‘U’ey in the first available driveway! OK, plan C me thinks, and back into Mullumbimby we go down the street that we’d first found ourselves in when David decided to turn around and go back because it wasn’t the right one. Argh! We had a small falling out at this point, which was understandable from both sides I would think, and for my part I had had a gutful of that damned map. Several U turns later I saw the little car yard/garage that was the first thing on the right as we’d come into town – it was now on our left and we were coming out of a side street towards it, so we hacked a left and gratefully retraced the road back to the highway again. 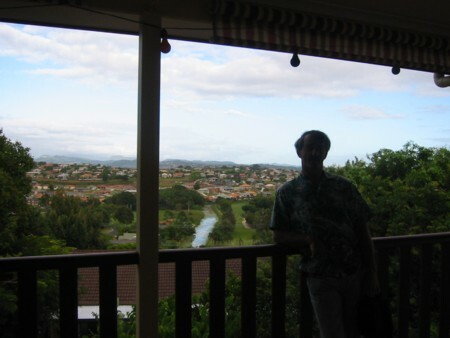 We certainly had got to see Mullumbimby! Up the highway just a little more, and then a right towards the ocean-side road again to make a beeline for Kingscliff. The reason for visiting here, and particularly planned to be an evening visit was that, long long ago, I was asked for a restaurant named Red Hot Chilli Thai here, and the guy that asked for it said to me that if ever I was up that way and liked Thai food to make sure I went there as it was brilliant. Well we LOVE Thai food, and had just planned our trip, so knew we would indeed be up that way and it was one of the first things on the agenda. I just hoped that they were open on a Monday night. I did research on the web and found the restaurant to be multi award winning, so we started filling the piggy bank to be able to eat there. I shouldn’t word it that way as it was normal pricing for a Thai restaurant, it’s just the way I word things. As we approached what should have been Kingscliff everything was saying another placename – I can’t remember what it was and it is not on the stupid map to remind me, but just as we were considering another U turn, things started to say Kingscliff. I guess it has a suburb on the non-ocean side and where Kingscliff runs along the ocean front, this other place runs along the back. Anyway, we found the restaurant first and THEN looked for a caravan park within walking (and not getting lost) distance so that we could both have a drink with our meal and then toddle home. We booked into the caravan park, which was within sight of the restaurant – all the better. The caravan park was nothing special, but all we wanted was somewhere to plug our power cord into after all. The fellow was friendly and gave us a site on the end of the row so we could look out of our bedside window and see the beach. I wanted to sleep with the window open to listen to the waves but David said the spray would come in, or some other wet (ouch!) excuse so we kept it shut. chairs and tables were out on the footpath and 2 fellows dressed in black t.shirts were relaxing back at one of the tables. They grinned cheekily at us as we hesitated in front of them and David said “Umm, do we have to book a table for tonight?” One of them looked left and right at the empty tables and said “Doesn’t look like it, but I can keep you in mind if you like. What time are you coming?” He told us they don’t start cooking until 6, so we said 6:30 would be good and went off to explore the other shops and cafes along the road. There were only buildings on one side of the road and they could see across, through bushes to the ocean. It was a typical holiday-style place, cute but shabby. 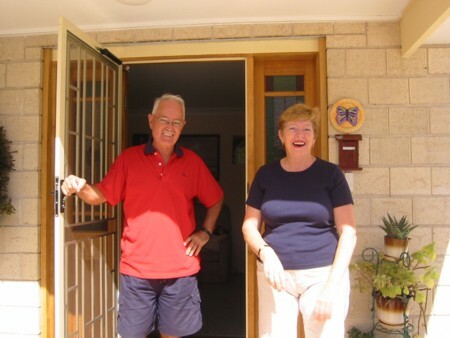 Before going to the restaurant, David rang my Mum’s friend Pauline who we’d arranged to breakfast with on Tuesday. She lives just south of Tweed Heads and was going to go to work late so that she could kindly entertain us. He asked her how long it would take for us to drive from where we were to her, and arranged that we would get there for 8am. She said it was only a 10 minute drive. 6:30 pm and time to go to the Red Hot Thai – exciting!!! Now as you may have already guessed, the awards were not for smart. 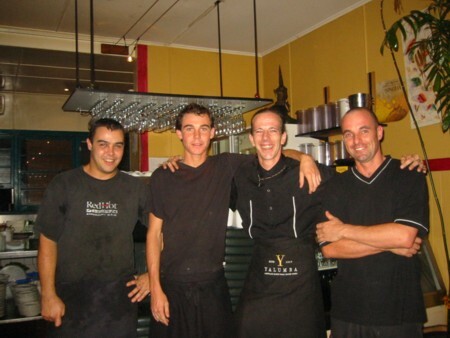 The 2 guys had been joined by a third and all were dressed in black t.shirts, black board shorts, and blundstone boots. The one that had looked around the empty tables was the cook, the other we’d already met seemed to be the owner and did some waiting and the third fellow spent all evening chopping vegies etc and washing up. The kitchen was completely open to the restaurant so you could see all that went on. The restaurant itself was very sparsely decorated with a wooden floor that tilted slightly – very handy when it came to getting the last of the sauce out of your bowl. Their awards, about 6 of them, were up on one wall and there was a big Thai lady statue. That was about it – could have used a woman’s touch really. But the food was very reasonably priced and totally deeelishus. My mouth waters to think of it. We had a mixed entree because we may never get back there and wanted to taste it all, and then 2 dishes which we shared for our main course. made a big show of the fact that he was gay. The four of them just made such a fantastic team and it was a complete entertainment experience as well as the amazing food. He asked us how we’d enjoyed our food and I told him how we came to be there; he was so thrilled to bits and rushed off to tell the others. When it was time that we had to reluctantly leave I asked if I could take their photo and they were all really pleased and lined up dutifully. The vegetable chopper gave me his email address so that I could send him a copy of the photo too. It was a wonderful and memorable evening. And do you know what? They are shut on Tuesdays, so we were very lucky! house. The whole house was just so lovely. I asked her about the time difference and whether we had arrived at the time she’d expected and she told us that her suburb is still on NSW time and it was only Tweed Heads itself that was on Qld. She sat us down at a table and chairs on the verandah and gave us the most incredible breakfast I’ve ever had. We started with fresh fruit salad and juice, then came bacon, eggs, hash browns, tomato and toast, then hot fruit buns, followed by coffee or tea. Oh boy was I full. All too soon we had to go so that we could continue our journey and she could get to work, but we’d had a lovely visit. Tweed Heads was only a stone’s throw away. This was a big place and we turned right once more to go to the beach. There were cars parked everywhere and it took a little while to find somewhere to put our great, lumbering van. 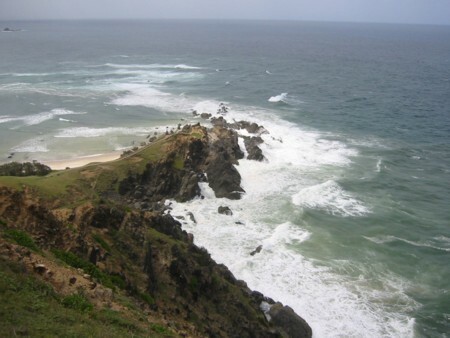 We then had to climb up the hill to get to see the beach. We found the wind to be blowing an absolute gale once we got to the top, but were rewarded with a huge concrete structure that you could walk through and were in New South Wales on one side and Queensland on the other. This was fun when we considered the time difference between the two as well. 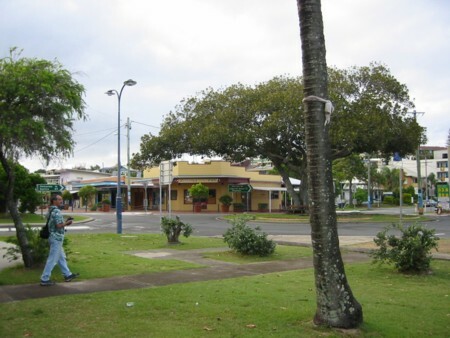 New South Wales finishes with the city of Tweed Heads and just the other side of the road, Queensland begins with the city of Coolangatta. You can see why Tweed uses Qld time! 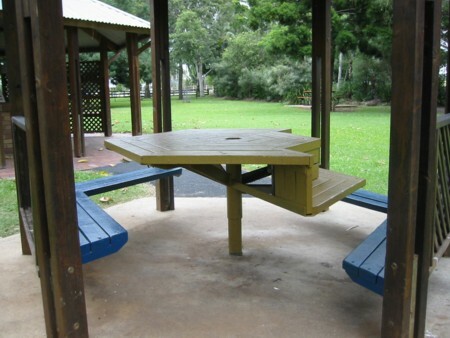 In winter they’re the same but in summer NSW has daylight saving so they’re different. Pauline works in Tweed so her work hours effectively change from one half of the year to the other, and when she leaves work at 3pm and drives for 5 minutes, it’s 4:05 pm at home. We wandered around a bit on the Qld side, including down to the beach, and there was a big surf carnival going on. We walked down the street but were very careful to make sure we could not possibly get lost – it was quite warm and we didn’t want to walk for miles. Then back to the van and continued on to look at some of the famed Gold Coast. There were many multi-story hotels, but it was not as bad as we’d feared. 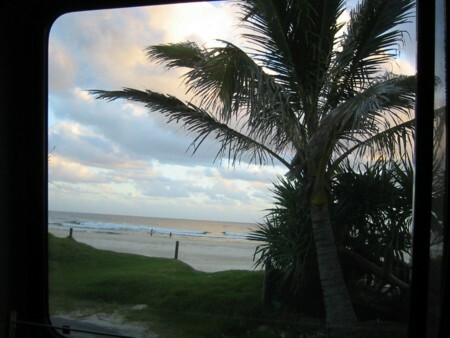 I love the place names on the Gold Coast and we drove through Palm Beach, Tallebudgera, Mermaid Beach. Aren’t they beautiful? We were looking for a huge shopping centre named Pacific Fair but I’d forgotten to look up where on the Gold Coast it was. Ooops!!! Pauline had told us she could drive there in 10 minutes so we did have some idea of how far it was at least, but just hoped it was signposted from the main highway. Fortunately, we had no problem finding it as it was right on the edge of the highway and as soon as I saw it I remembered the suburb was Broadbeach. Would have helped if I’d remembered sooner but didn’t make any difference except to our feeling of knowing where we were. We turned hesitantly into the road-bridge which was signposted because we didn’t know if we’d suddenly get to a height limit and feared having to reverse back. We followed a road around to the right and it did go under the building, but clearance was 4 metres so no hassle at all – must be made for the delivery trucks. Eventually we went up some ramps and parked next to another coach on the roof top with no problems. just really classy. Oh! Automatic sliding doors to get in there too, hehehe. How nice not to have to use a doorhandle shared by others who may not have washed their hands! Then we found the information kiosk and got a map because it was all too daunting. Even then we stood outside the kiosk in stunned mode, gathering our senses, and one of the cleaning staff came and asked if we needed help. Wasn’t that gorgeous? In front of us was the children’s area, which was delightful; there was a little pretend train with cartoon characters in it up above where it could be seen but not interfered with. Under this was a circuit with little electric cars which were useable, and then there were quite a few ponds with lillies and things in. 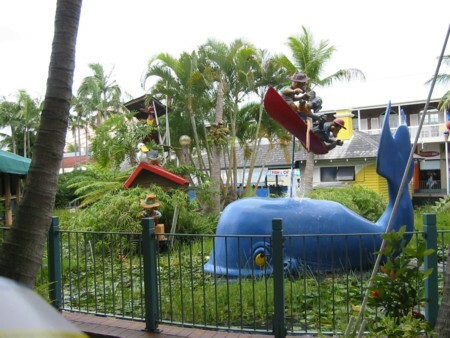 But they weren’t just lily ponds, there were all sorts of decorations as well, like a huge blue whale with water spouting out the top and a working water wheel about 6 foot high. We were just in awe of it all, and the wonderful warmth and the few gardens with short plants cut into animal shapes. It was not a place just for shopping. David and I have always had a golden rule for shops, markets or anything of that kind that’s new to us; we keep left and do the circuit ‘there and back’ to make sure we don’t miss anything, but there was no order to the ‘streets’ in here, it was all a jumble so our rule would not help us. We just had to wander and hope for the best. Suffice to say that it was wonderful and we both really enjoyed our look around. We went into some of the shops purely because I’ve been asked for them at Directory Assistance and wanted to know what they sold, how it was displayed… just a general picture so I had something to call to mind when I’m asked for them again. We’d missed out on Pancake Day due to travelling so decided to lunch at one of the 2 pancake cafes – I had seafood on mine and David had strawberries and cream. I took a photo of Amie’s Jewellers for our Amie. I knew they existed, there are several of them in Qld, but I thought Amie would love a picture, and we went in and picked up a catalogue for her as well. By the time we finished looking around, we did feel that we had a fair handle on navigating the centre, and we found the van without any trouble at all. Truly!!!!!! Once we got back in the van I said “Naaaaafid…..” which is his signal to think fast of an excuse for anything that I’m about to ask. But he wasn’t fast enough; there was another shopping centre I wanted to see in the area. I did ask nicely and would have accepted a no, but he said ‘why not?’ even though it meant going back a little on where we’d come from. 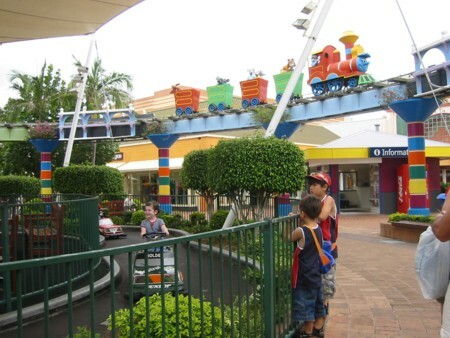 This one was called the Robina Town Centre and we found this one easily as well. Must be improving? 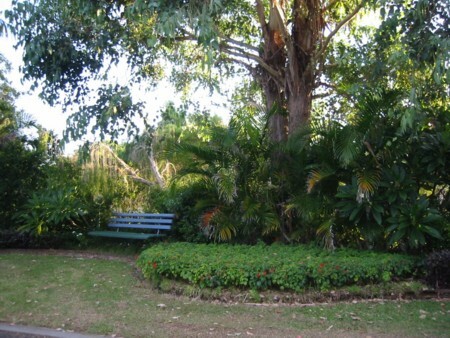 It had been a shock to me that Robina was inland – as in not on the Gold Coast strip. I suppose I’d imagined all the suburbs lined up in a row which was silly of me, but the inland phone book covers what they call the hinterland so I’d imagined anything in the Gold Coast book was truly coastal. There isn’t a lot to say about Robina, but even so I’ll continue with the story on the next page. Next page/… Please feel free to leave a comment in the fields below before leaving this page. Email addresses will not be used in any way, nor displayed for anyone to see.